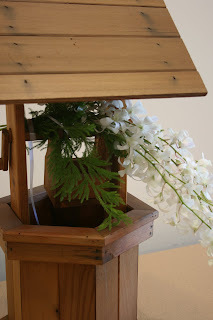 Dendrobium orchids and fern foliage adorn this simple wooden wishing well used to drop guest’s wishes for the happy couple in. 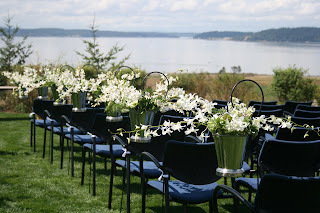 Shepherds hooks holding sleek silver pails filled with dendrobium orchids, mosses and lush greenery add to this fabulous NW setting. 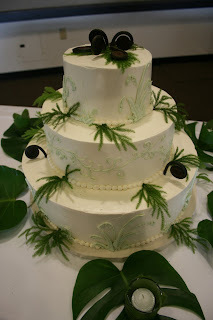 Fiddlehead fern curls and foliage are used to adorn the cake. Montera leaves, or “swiss cheese” leaves are placed on the table with a single votive candle on each. 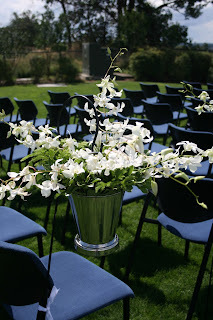 Is this Julie and Eric’s wedding, Aug. 18th at the Enviromental Services Building?